What’s not to love about watermelon? Not only is it summer’s most-loved fruit, but everyone just can’t get enough of the watermelon’s feminine, fun, and vibrant coloring! It probably comes as no surprise that watermelon crafts are hot property on Pinterest right now – from tote bags carrying the print to watermelon-inspired home decor, clothing, and everything else in between – you just can’t go wrong with a good ol’ watermelon DIY. Luckily, we’ve rounded-up 40 of these fun-filled projects for you to try today! If you’re obsessed with EOS lip balms and want to customize yours into something incredibly cool, then this YouTube tutorial is for you! Aira Tran DIY will show you how to turn yours into a watermelon lookalike. Got a pair of plain white sneakers lying around at home? Why not transform them into this colorful watermelon inspired design, just as Bespoke Bride has done? This watercolor watermelon picnic rug from Brit + Co is perfect for long summer days spent under the sun! It’s fun and easy to create too. Get your ‘back to school cool’ on during the break and create this DIY watermelon notebook by ALEXtraordinair DIY via YouTube! We love this fun and fruity alternative to traditional Easter eggs from By Dawn Nicole! Your guests or family members will adore these too. How cool is this watermelon print pouch from Damask Love? You can store all sorts of things in here – from pencils or pens to makeup, craft items, money, and more! Darby Smart has created these DIY watermelon plant pots and we think they’d make the perfect décor, whether it be for your garden or coffee table! Be sure to check out the full tutorial for more info. These little watermelon pouches from Delineate Your Dwelling serve as great party favor bags, but they can also be used to house sunglasses, your iPod, or just about anything else you wish! Here’s a clever and colorful watermelon inspired bowl from Dream a Little Bigger – isn’t it wonderful? This is the perfect project to tackle this weekend. Fancy creating your own watermelon embroidered bag, just like this one? You’ll find the full and in-depth tutorial via eHow! Who knew that creating a fun watermelon garland could be as easy as 1,2,3? Elizabeth Kartchner certainly did, and now she’ll show you how! If you’ve got an old and boring pair of wedge sandals hiding in your wardrobe, it’s time to give them a makeover! Take inspiration from Homemade Banana and paint them in a fruity watermelon design. These mini watermelon pinatas from Julep serve as the perfect party favor – don’t you think? They’re filled to the brim with candy and who can resist their colorful shades? Here’s a fun watermelon craft project that your children will love! They can create their very own watermelon shaped sun catchers simply by following this tutorial from Kid’s Activities Blog. These mini watermelon felt necklaces are the perfect craft project for children to make for their friends. Let’s Do Something Crafty will show them how to easily make these! This watercolor watermelon tote bag is both stylish and eye-catching! Madame Citron created hers with ease, so be sure to follow her instructions to recreate your own. Speaking of DIY watermelon tote bags, here’s another creative version from Make and Fable. This design uses watermelon shaped stamps for a fun look! You can even create your own watermelon stickers, just as Maritza Lisa has done! What fun projects will you use your stickers for? Mary Costa Photography shows us that creating a watermelon inspired balloon needn’t be a difficult or time-consuming task! She simply used a black Sharpie on a red balloon to create an awesome effect. Oh my! Have you ever seen such a beautiful skirt before? McKenna Bleu used fabric dye to get this stunning effect and the good news is that you can too! Just be sure to follow her guide. Mr Printables is so talented to make this DIY watermelon pom pom! It might look tricky, but we think any pom pom lover can create their own with determination and by following the full tutorial. How great are these wind socks? They remind us of the traditional Japanese fish wind catchers, but My Cakies has created a fun new watermelon inspired design. Awesome! This DIY watermelon soap isn’t just pretty, it’s also great for your skin too! My Frugal Adventures shows us that creating your own soap isn’t as hard as it looks. This DIY watermelon tray from Oh So Beautiful Paper is gorgeous! It’s perfect for serving breakfast in bed, along with dishing up afternoon tea for a guest or even carrying multiple mugs of coffee. Pizzazzerie recently hosted a birthday party for her one-year-old and these were the DIY party hats on offer! If you’re thinking of throwing a watermelon themed party any time soon, you’ll certainly want to make these. These DIY watermelon pin cushions might look in shock, but we assure you that no watermelons were harmed in the making of this craft project! Want to make one for yourself? Check out Quilt Mag’s full tutorial. Wow, you can even create watermelon inspired candles! Rustic Escentuals has an informative and easy-to-follow tutorial for those interested in making their own. Watermelons scream ‘summer’, so how about making a beach ball in the easily recognizable pattern? Sarah Hearts is the super talented blogger behind this DIY project. It’s not just a squeezy stress ball…it’s also a bar of soap! If you don’t quite believe us, then we urge you to check out the amazing DIY video tutorial by Soozooya via YouTube. If you’re stuck for a fancy dress costume, why not go as a watermelon? It’s so simple and enjoyable to create your own watermelon costume, just as Studio DIY has done! Brush-off that gloomy weather doom with your very own DIY watermelon umbrella. It’s vibrant, colorful, and a good reminder of summer, so be sure to check out the full tutorial via Studio DIY! Speaking of summer (and watermelon DIY projects), Studio DIY has also made a sun hat in the beautiful pattern! We think it’s a fantastic idea. Your little one will love this DIY tie-dye singlet in all of the colors of a watermelon! You can easily complete this over a few afternoons, so why not get started today by checking out the tutorial from Sweet Lil’ You? Inspired by a Kate Spade purse, That Black Chic decided to create her own watermelon purse version…on a shoe-string budget! The result? This gorgeous look-a-like! The Country Cottage will show you how you can easily transform a thrift store Mason jar into this wonderful DIY watermelon version. These would make great gifts too! Welcome visitors into your home with this snazzy DIY watermelon mat. It looks so good that they’ll ask where you bought it from! The House That Lars Built has the full, wonderful tutorial for you. Throwing a dinner party any time soon and want some unique napkins to wow your guests with? Luckily for you, The Sweetest Occasion has created these DIY watermelon print versions. They’re gorgeous! When you think of summer, watermelons and sunglasses certainly come to mind! Kelly from Studio DIY certainly agrees, so created this DIY tutorial for watermelon print sunglasses on eHow. We’re in love with this DIY watercolor watermelon tea cup found via Marie Claire Idees (the French version of the popular website). Create a whole set of these for unique drinking vessels that won’t go out of fashion! It just wouldn’t be a complete watermelon DIY project round-up without some watermelon inspired coasters! Thankfully, Young at Heart Mommy has created these versions using slices of wood. Brilliant! 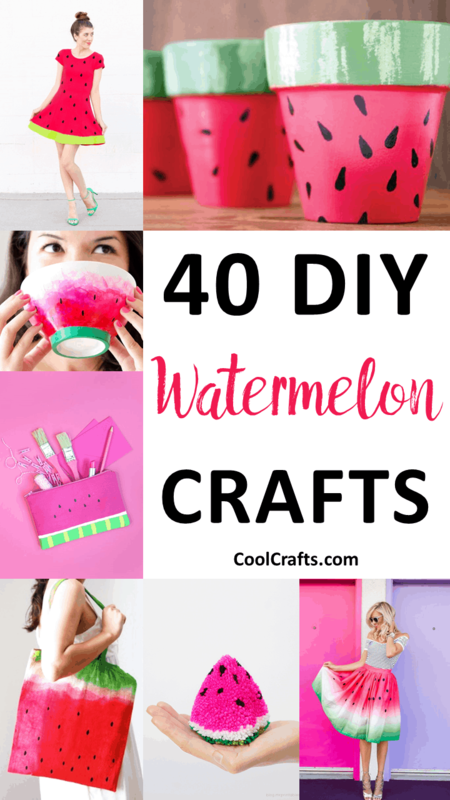 There you have it – 40 amazing watermelon crafts that you can make today! Which ones were your favorites? We’d love to hear from you in the comments section below! Your round-up is great and I am in good company! I see some projects I want to try!